In order to be true to the film, the "director's statement" is the story of two women who met working on a film about women in Africa. The composer, Patricia Lee Stotter, had started working with veterans on a variety of projects, and the director, Marcia Rock, became interested in disability issues through her friend Simi Linton, author of My Body Politic. They were talking about whether the US was ready for all the vets disabled by IED explosions. Stotter was the first of the team to penetrate the veteran world. After she was, literally, vetted by the vets, she approached Marcia Rock about creating a film and cross platform project about disabled veterans whose transition from active duty had been eased with the help of service dogs. We, and this has been a joined at the hip venture, felt the social networking had to be as much a part of this project as the film-making. 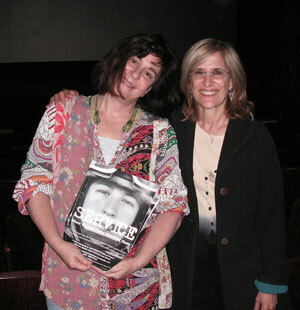 We immediately set up a FB group and website http://servicethefilm.com so we could network with vets. Though we began by exploring the relationship between service dogs and vets with both visible and invisible injures, we realized that female vets had special issues and insights into their military experience not covered by the press except for reports on military sexual trauma. So from Patty's start doing testimonial theatre with widows of suicides, vets from Viet Nam, to her work at CUNY with the student veteran club, to Marcia's history of making films about women, the project led us both to the heart of the issue: the special needs of female veterans. The heart that touched our hearts. It is a harmonic repeat of the project that two women created this multi-platform creation--so much of the story is about the bond of sisterhood under duress, under attack.